Star Wars Battlefront: Elite Squadron (DS Lite) I have been searching for this game at every GameStop I go to. Completely regret selling it for 5 bucks. One of my favorites. DS lite has no games specifically for it. Right, I actually didn't quite know that, I haven't owned anything lower than the DS Lite. Another good title I'd say is Namco Museum 50th Anniversary (GBA). They made a series of these across many platforms, most notable of which in my opinion was on the original Xbox where they included my favorite JP arcade game of all time, Bosconian. Pretty sure the GBA version only has 4-5 games though. Dig-dug, Rally-x, Galaga, some Pac-Man's, that kind of thing. Edit: although, weren't there some option paks designed exclusively for the DS Lite? I'm not really sure, but I think there were. 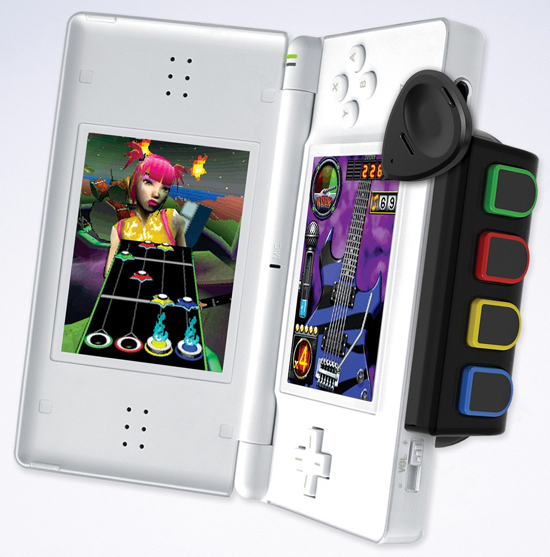 I'm having a vague image of a guitar hero handheld set which attaches to the DS Lite. Here’s some of my suggestions: GBA: WarioWare, Inc. Pokémon Fire Red Mario Kart Super Circuit DS: Naruto Path of the Ninja 1 & 2 (great games if you like Naruto and RPGs) Star Fox Command Mario & Luigi: Bowser’s Inside Story (also my favorite DS game ever) Pokémon Ranger: Guardian Signs / Shadows of Almia (my favorite Pokémon spinoff games) Pokémon Platinum (My favorite main series Pokémon game) SNES: Super Mario World NES: any of the original 3 Mario games GBC: Pokémon Trading Card Game (best strategy game ever) 3DS: WarioWare Gold Naruto Powerful Shippuden (I like Naruto a lot) Super Smash Bros. 3DS Terraria Pokémon Omega Ruby I have a lot more but I thought this list was already long enough lol. TERRARIA!!!!!!!!!!!!!!!!!!!!!!!!!!!!!!!!!!... Even more of it. #31 ✎ 278 ProKuku QSP Contest 1 Contest Participant I participated in the first SmileBASIC Source QSP Contest! I was thinking of putting it on my list, but then it seemed too biased, considering this is a website meant for SB lol. Here’s some of my suggestions: DS: Naruto Path of the Ninja 1 & 2 (great games if you like Naruto and RPGs) I have a lot more but I thought this list was already long enough lol. TERRARIA!!!!!!!!!!!!!!!!!!!!!!!!!!!!!!!!!!... ...is fun. If you havn't already, try out the PC version of Terraria, it has loads more content including events, bosses, and items, including the celestial events, Moon Lord, And all of the Moon Lords drops like the Last Prism! Anyway... I should be on GameFaqs for terraria or something, but the rest of these games are fun too! Terraria is my favorite, though. I actually have played the pc version, and oddly enough, I don’t like it as much as 3ds version. I think it’s the controls that I liked so much for 3ds, but didn’t have for pc. It’s also probably because I played so much terraria on 3ds that it’s just not fun anymore lol.